Today in the Library we have ­­­­­­­­­­­­­­­­­­­­Carla Vermaat, who has dropped in to say hello and to share some insights into her life as an author. My name is Carla Vermaat. I am originally from The Netherlands, but I live in Cornwall in the UK now for about 10 years. In Holland I have published 20 crime thrillers and romance novels – the next one is going to the printer as we speak. I also wrote over 65 romance stories (23k words) for a Dutch magazine. I currently live on the Cornish north coast, close enough to the beach to go for a walk. I have always been reading. I remember we celebrated ‘Sinterklaas’, sort of the Dutch equivalent of Santa Claus, only the date is on the 5th December. As a family we used to come together at my grandmother’s and as we were with 8 adults and 6 children, we all had only one or two presents. Mine was always a book and as soon as it was time to unwrap it (which we did in turns) I started to read it… I have periods that I read a lot, other periods I don’t read at all. I tend to prefer books in my own genre, there are enough available! Both. I am still publishing my books in The Netherlands in Dutch with Ellessy, a publishing house. (In Holland authors generally don’t deal with literary agencies). My (first) book in English is partially self published, in cooperation with my Dutch publisher, but I do the marketing, etc., here myself. I mostly write crime, although occasionally my Dutch publisher asks for a contemporary romance. I do one-offs but I am also writing one book a year for a series about an Amsterdam based policewoman. 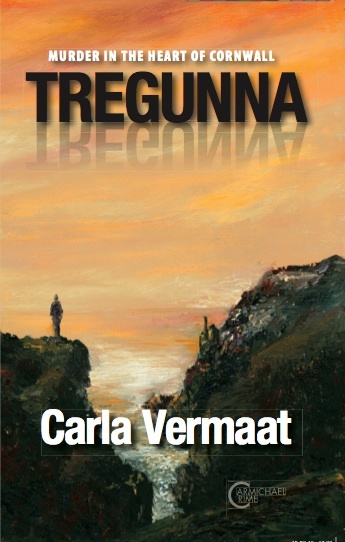 My first book in English, Tregunna, is also the first of a series. I don’t think so, although we can never wipe what has formed us or our experiences. Proofreading is my worst nightmare. I hate to have to read the story over and over again when I get it back from the editor. I can’t say you can overcome it, you just have to sit down, get your head into gear and do it. Mornings are better, although I can write any time of day. Best thing is that you can let your imagination go, create families and characters and live a second life for a while. There is no flipside – I love it. Having partially self-published Tregunna, I became aware that I didn’t know enough about marketing. I have always believed that a good thing only needs word-of-mouth advertisement, but this industry is slightly different. Eventually you will get there without any marketing, but it may take a few years, or even decades. I don’t particularly like using platforms such as FB and Twitter, etc., because it takes so much time – which may explain why I don’t use them much. Painting; when I’m not writing, I paint landscapes and seascapes. I wouldn’t read, I would write – about my feelings, I guess. Please tell us your latest published work. My book is called, TREGUNNA. In a farmhouse on the Camel estuary in Cornwall, a 5-year old girl finds her parents brutally slaughtered. Fifteen years later the house is deserted and the killing still remains a mystery. Then the body of a 50-year old woman is found on a cliff edge in Newquay. DI Andy Tregunna is faced with the task of leading the investigation, but soon personal matters force him to step back. On compassionate leave and with little else to do than fight his own demons, the unsolved case becomes more and more an obsession to him. As he is drawn deeper into a dark world of secrets, lies and revenge, his private investigation collides with his personal life. I’m a non-native English speaker writing in English, so I really relate to Carla. Though I don’t have so many published works as she does.